However, with an ideal USA travel SIM card, you can get rid of the hefty roaming charges. The question arises which SIM card will help you avoid this problem when you are going to travel all through the US. Though you may not have as many options as are available to you when traveling Europe, within the States, you have a handful of options. However, if you choose to go with a USA travel SIM card from Pix World, it saves you money and allows you to enjoy a better quality of service while traveling or staying in the United States. It allows you to enjoy unlimited talking, texting, surfing and browsing data in a fraction of cost in over 193 countries. It lets you enjoy chatting on apps such as Skype, WhatsApp, Facebook messenger, Viber, Line, We-chat. Moreover, when you want to buy this SIM card, you need not sign any contract and pay any extra hidden charges. The USA travel SIM card facilitates you full control over the risks and costs, for it is prepaid by nature. To provide you peerless mobile connectivity while traveling to the US from any other countries, the Pix World has collaborated with over 150 global network operators. The mobile carrier is strengthened by the America’s largest 4G LTE networks. The SIM also enables you to earn rewards through its miles collection reward program. According to this program, the more miles you cover while talking the more awards you get. In addition to offering you coverage in 193 countries, the SIM card also brings to you coverage in over 200 cruise ships. How to activate your USA travel SIM card? The Pix’s USA travel SIM card is a triple-SIM card, which can attune with any unlocked device. This signifies you can use it with phones and tablets, and its airtime/credit will last for 1-year from your last recharge/top-up. The SIM stays “live” only if you get it recharged once a year. Insert the SIM into your smartphone/tablet device. Fund your SIM fast with a credit card. Select out a plan from the homepage. 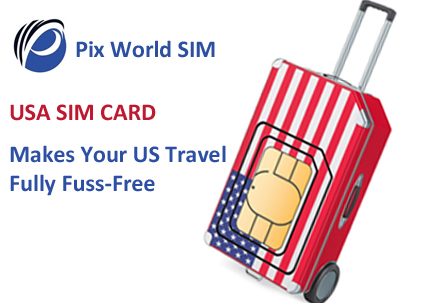 So, dissimilar to other USA travel SIM cad, the Pix World’s USA Travel SIM Card will keep you connected to all your closed ones sine the hassles of frequent call drops, undelivered messages and more. Looking to travel abroad for an extended visit? Great. Right now, you are seeking all possible actions that will keep you connected to all those who matter the most back home. Nonetheless, staying-on-line is not at all inexpensive when it comes to traveling abroad. And if you trust your local telecom service provider, your mobile bill is surely going to leave you awestruck. Even if you want a solution to this, then choose to go with an ideal USA travel SIM card. As soon as you start your search for world’s top SIM cards, you will totally be surprised by the total number of options that you need to struggle to choose only one. But, hey, your wait for an ideal SIM card is over now because we are going to offer you the superb low-down on the best world SIM solution available — Pix World. Here, you will learn about all the great advantages that have encouraged end number of travelers as you to pick this ultimate USA Travel SIM Card. Inserting this SIM card in your qualified unlocked devices (smartphones/tablets), you can enjoy unlimited talking, texting, surfing and browsing within a fraction of cost. So, whether you’re traveling abroad or in your own community, this travel SIM card will allow you to stay connected to all your near and dear ones, anytime, anywhere. Furthermore, this travel SIM card remains active in over 195 countries around the world. This way, with this SIM in your device, you are not going to encounter any sort of mobile connectivity issues such as talking, texting, surfing, browsing and data accessing. Looking to save 120 percent of your roaming charges right away? Just choose an ideal plan for you and get ready to save 120 percent. This is, for sure, a tremendous saving! With an ideal plan, you get the best deal as compared to your other local network operators. What’s more? Well, in addition to allowing you to talk and text at affordable call charges, the SIM provider provides you with the best when it comes to call quality and network strength. To provide you with the best possible mobile connectivity solution and wireless freedom, the mobile carrier has collaborated with more than 150 networks operators. Now, if you are looking to leave for a trip overseas anytime soon and want to get the talking, texting part resolved, find out the amazing experience provided by Pix World. Cost of global roaming matters most when it comes to travelling and staying in abroad. While some global SIM cards do offer satisfactory wireless solution, using them cost you a lot of dime. However, thanks to certain global SIM cards, not do only they work great, but come within a fraction of cost, as well. Besides, when you insert such a global travel SIM card in your unlocked device, you can enjoy impeccable wireless freedom and mobile connectivity while traveling to the US. So, say welcome to the world of Pix World, your perfect USA travel SIM card, revolutionizing the wireless freedom and giving a new definition to the affordability! 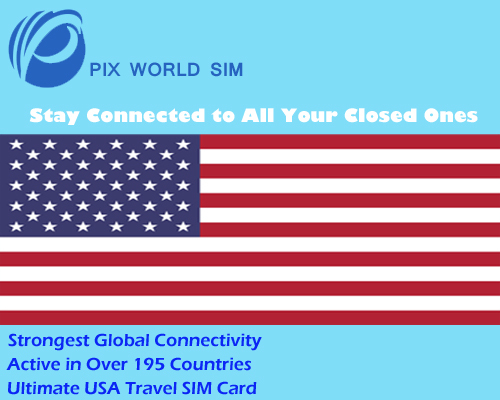 Pix World’s USA travel SIM card allows you to enjoy and experience amazing wireless connectivity whether you are in your community, or planning to travel abroad. As you insert this SIM card in your unlocked devices (smartphone and/or tablets), you can communicate freely with your friends and family members, anywhere, anywhere. That apart, the SIM card also lets you make and receive calls, send as well as receive text messages, and/or access data on the worldwide web within a fraction of the cost. But, how does Pix’s USA travel SIM card make it all possible? It will allow you to call and surf at the lowest roaming charges in more than 193 countries. It will allow you to collect miles & more award miles while using prepaid world SIM card. It doesn’t require you to sign any contract, ties, and pay any additional hidden charges and more. It will allow you to have full control over risks and costs. Thus, Pix’s SIM card not only keeps you connected to all your near and dear ones, but also saves you 120% on roaming charges along with an impeccable wireless connectivity. Pix World makes it all possible by offering its callback service. When you make an international call by inserting this SIM card in your unlocked mobile phone, the leading mobile carrier in the US picks up the call, connects it to the number you dialed and gives you an instant call. This way, it simultaneously hooks up two lines. This international SIM Card, thus, guarantees you secure connection and superb sound quality. To offer such an amazing wireless service, Pix World works in tandem with more than 150 global network operators, which operate on the superfast 3G and 4G networks! So, buy Pix’s USA Travel SIM Card and say goodbye to the hassles of frequent connectivity breakdowns, call drops, repeated interruption while browsing and downloading! 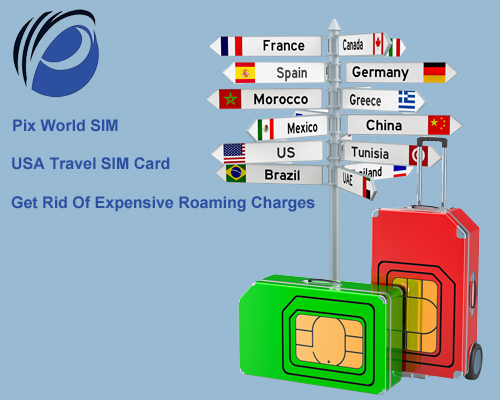 The SIM card offers hassle-free wireless freedom in more than 193 countries and 200 plus cruise chips.